I couldn’t believe my eyes when I received this set. The necklace and bracelet are heavy, beautiful shine they have, I can’t wait to wear it all together. I use the bracelet often is so pretty and I get lots of compliments. Couldn’t find anything better. 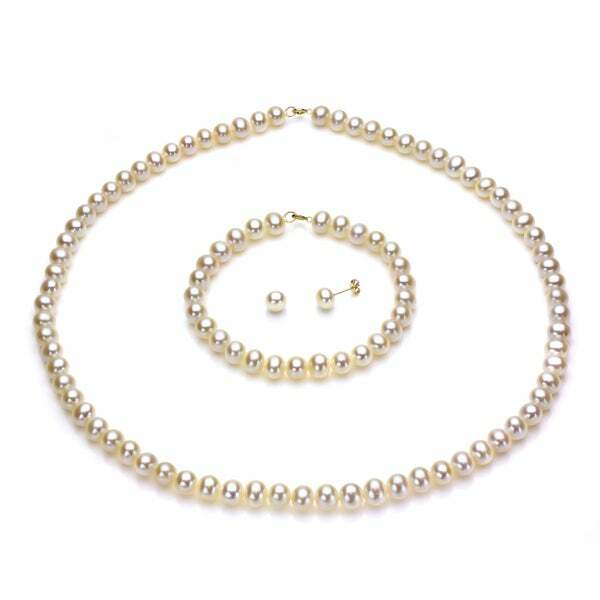 This divinely decadent pearl jewelry set will lend a polished look to any ensemble with the classic and delicate sheen of white cultured pearls. A set of jewelry so sweet and feminine, this necklace, bracelet, and earrings also make a lovely gift for a special occasion. I bought these pearls for my fiance' to wear at our wedding. Overall, I'm pretty satisfied with them. This is a good three-piece set, but there were two small problems I had with it: the bracelet is really, really short, and it would have been nice if the set came in a gift box. Other than that, this is a really good set of pearls. I loved the set, however my Niece (Graduation gift! ), has a larger wrist so bracelet was to small. Pearls had Great luster, sizing was proportionate to each item in set...earring, bracelet, and necklace. Very nice...just that I needed a larger bracelet. Comparable to expensive sets, clasp are small, so if you have difficulty with a spring clasp that may be a problem. Good quality otherwise...I would have kept the set, except for bracelet not fitting. Every Lady needs set of pearls...from Jeans to gowns they always add style! These pearls were very nice: earrings, bracelet and necklace set. The pearls were tied INDIVIDUALLY which lessens the chance for loss if a break occurs. I would recommend. They were an excellent 16th birthday present and made my niece very happy. When I received the Freshwater Peal set with necklace, earrings, and bracelet, I was surprised with the weight, feel, and cworkmanship. This set makes an excellent gift. I am really pleased with them. Very beautiful matching set. I was extremely pleased with them. Pearl sizes are consistent and the color is lustrous and beautiful. Negatives are that the clasp is too small, and you'll need help getting the bracelet on for sure; it is not hand-knotted in between each pearl so if you break the strand, all your pearls are gone! ; finally, the 6-6.5mm size is too small for me, but it is personal preference. Overall, it's a really great value and deal! I was kind of surprised because I have ordered other pieces from Davonna. However this set appeared to be lacking the quality of previous purchases. The earrings were nice, as were the pearls themselves. The clasp on the necklace and bracelet really cheapened the overall effect. Plus the bracelet turned out to be about 6". This would be fine if it was a gift for a teenager but not for my wife. This products get 4 out of 10. The pearls have a great sheen to them. Good value for the money, the only disappointment is the quality of the clasp on the necklace and braclet. Bought set for my daughter eedding jewelry. Looked fabulous. She did where another pair of pearl earrings I purchased from site. She has already put set up to give to her daughter several years from now. I bought these as gifts, and think I will return them. The clasps are hard to work and are really delicate. I don't want to give them to anyone as the clasps cheapen the enitre look. The pearls are small and pretty, but I am worried the strands are going to break. I would never have bought these had I seen them in person first. I am debating what to do with them now. this is a good product and a great value. everyone that has seen them think i paid a fortune including my girlfriend. Before I had purchased my pearls I read the reviews and was expecting them to be soooo small. BUT, I was pleasantly surprised when I received them. Yes, they're on the smaller side, but they are PERFECT for those who just want something demure and classy w/o being "too much" or "too big". Also, they have a really good weight to them, if anyone is looking for something w/good weight. Overall it's a great deal for what you get, and they're beautiful! Beautiful pearl set. I am so happy to have it! Highly recommended. I received this set as a gift last year. They are very beautiful for the price, but the necklace broke the first day I wore it. I was able to tie up the white string again to secure the pearls, but it broke again just a couple days ago even after being very delicate. They were a gift. She loved them. She wears them all the time. Very nice! The pearls are very nice and compliments anything I wear. They have been a staple of my wardrobe for a very long time. I would purchase again! The pearls were perfect. They were in a hard case. This order is for my employer. She is a special lady. I Love you Overstock. She was so pleased with the order she did not know what to say. ...but Thank You! The pearl were exceptional quality. They were big enough i thought. They were in her words..."gorgeous!" Bought this for a graduation gift for my daughter. Very nice set for the price. Would order again if needed. its Beautiful, I would have to go to the jeweler to get the spring ring claps bigger, to be able to put on. And the butterfly for the earring bigger. They are too tiny, hard to put it on. I actually purchased these for a friend of mine daughter for her birthday. She absolutely adored this. They were perfect! The color of the set is so vivid. I purchased these as a gift for my niece. She wears them everywhere and all the time. Absolutely adores them. A great gift at great price. They also arrived within few days of purchase! the pearls were a lot smaller than I expected but the set is beautiful. "What country makes this set?" Hello mendlich, this set is made in Hong Kong. Thanks for shopping with us! "Does this product come in a Box?" The first review on our site said that they were packaged in a nice velvet, burgundy pouch.